Neuroimaging, Part One, a text from The Handbook of Clinical Neurology illustrates how neuroimaging is rapidly expanding its reach and applications in clinical neurology. It is an ideal resource for anyone interested in the study of the nervous system, and is useful to both beginners in various related fields and to specialists who want to update or refresh their knowledge base on neuroimaging. This first volume specifically covers a description of imaging techniques used in the adult brain, aiming to bring a comprehensive view of the field of neuroimaging to a varying audience. It brings broad coverage of the topic using many color images to illustrate key points. Contributions from leading global experts are collated, providing the broadest view of neuroimaging as it currently stands. For a number of neurological disorders, imaging is not only critical for diagnosis, but also for monitoring the effect of therapies, and the entire field is moving from curing diseases to preventing them. 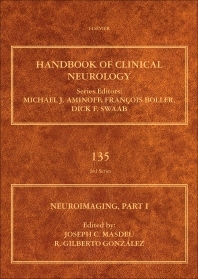 Most of the information contained in this volume reflects the newness of this approach, pointing to this new horizon in the study of neurological disorders. Parts 1 and 2 of this handbook provide a comprehensive collection of concise chapters covering nearly all areas of neuroradiology, written by recognized leaders in the field. Each chapter contains up-to-date information, with well-chosen references for further study. Despite the diversity of topics, the organization is logical, starting with imaging methods and followed by pathology and common indications for brain and spine imaging, as well as pediatric neuroimaging. Chapters on neurointervention and high-resolution postmortem imaging contribute to the distinctive nature of this collection. Section I focuses on the wide range of neuroimaging techniques, including myelography, an important topic that is often neglected in the age of magnetic resonance imaging (MRI) of spine disorders. These sections provide excellent background for physicians in all fields of neuroscience, as well as useful review for radiologists and radiology trainees. Both technical and practical information is provided. Hot topics, such as dual-energy computed tomography (CT), as well as established techniques like MR perfusion, are described, and useful examples and illustrative images are provided. The section also includes chapters describing nuclear medicine examinations, such as positron emission tomography and single-photon emission CT, which are now an integral part of the workup of neurodegenerative disorders. The next 3 sections review diseases of the brain, spine, and peripheral nervous system. Magnetic resonance neurography, a relatively new technique, is given excellent coverage. MRI and ultrasound of skeletal muscle are reviewed, a novel addition to a neuroradiology text, given that these are studies typically interpreted by musculoskeletal radiologists. Sections V and VI are a strength of this text, describing the proper imaging evaluation of common neurologic syndromes and approach to the differential diagnosis of common imaging findings. The authors provide recommendations and clear rationales for choosing the appropriate imaging examination based on patient history and symptoms. In the differential diagnosis chapters, the reader is taught to interpret imaging findings like a radiologist, an exercise that should prove valuable and interesting to all specialists who personally evaluate imaging studies. Section VII provides an overview of the most common pediatric pathologies. Three chapters are dedicated to cerebral vascular intervention, covering the primary indications for these techniques: endovascular treatment of stroke, aneurysm, and arteriovenous malformations. Treatment options and succinct summaries of clinical trials are valuable additions. The final chapter is unique, detailing the role of postmortem imaging in validating MRI properties with direct histopathological correlation. This creative collection should prove interesting and valuable to a wide range of practitioners and students who wish to increase their knowledge of neuroscience and the broad choice of neuroimaging tools available to study the human nervous system, spine, skull base, and head and neck. Joseph C. Masdeu, MD, PhD holds the Graham Family Distinguished Endowed Chair in Neurological Sciences at the Houston Methodist Institute of Academic Medicine and leads the Nantz National Alzheimer Center and Neuroimaging at the Houston Methodist Neurological and Research Institutes. He is Professor of Neurology at Weill Cornell Medical College. Dr. Masdeu is interested in the application of neuroimaging tools, including new molecular neuroimaging markers, to the study of neurodegenerative brain disorders. By clarifying disease mechanisms and providing quantifiable markers of disease progression, this research will lead to the production of new medications and greatly facilitate the testing of new therapies in smaller and better characterized patient samples. A native of Spain, where he became certified in Psychiatry after his MD degree at the University of Madrid, Dr. Masdeu is a US citizen who completed residency training in Chicago and was certified in Neurology by the American Board of Neurology and Psychiatry in 1976. He was a fellow in Neuropathology at the Brigham and Women’s Hospital of Harvard Medical School in 1976-77. In the 1980s, at the Albert Einstein College of Medicine, in New York, he directed the Alzheimer research component of a Program Project on Aging and Dementia. From 1991-2000 he was the Chairman of Neurology at the New York Medical College. He was Professor of Neurology and Director of Neurosciences at the University of Navarra Medical School, in Pamplona, Spain, from 2000-2008 and a Senior Staff Physician and Scientist at the Section of Integrative Neuroimaging of the Clinical Brain Disorders Branch of the Intramural Research Program of the National Institutes of Health (NIMH) from 2008-2014. He is the author of 142 peer-reviewed papers, 61 book chapters, and of seven books, including “Localization in Clinical Neurology,” now in its 6th edition. With a longstanding interest in neuroimaging, he is chairman of the Neuroimaging Research Group of the World Federation of Neurology. He has been a director of the American Academy of Neurology and president of the American Society of Neuroimaging. Since 2007 he is the Editor-in-Chief of the Journal of Neuroimaging. Dr. R. Gilberto González is Chief of Neuroradiology at the Massachusetts General Hospital and Professor of Radiology at the Harvard Medical School. He received his MD from Harvard Medical School and a PhD in biophysical chemistry from the University of California at Santa Cruz. He did post doctoral work in molecular biophysics at the Francis Bitter National Magnet Lab at MIT. His clinical training included an internship in medicine and a residency in radiology at the Brigham and Women's Hospital in Boston, and a neuroradiology fellowship at the MGH. He has published over 200 original, peer-reviewed scientific papers, over 100 chapters and reviews, and 3 books. He has published in the areas of ischemic stroke, brain tumors, cerebral hemorrhage, AIDS dementia and Alzheimer's disease, and has received research funding from the NIH, foundations and medical enterprises. He has given over 150 invited lectures at universities and at scientific meetings in the US, Europe, Latin America and Asia. He has received several honors including the Outstanding Researcher Award from the American Society of Neuroradiology, and has given the Taveras (Harvard), Newton (UCSF) and Wood (UNC) Lectures. He has reviewed grant applications as a member of NIH study sections and for several scientific organizations. Dr. González has been on the editorial board of the American Journal of Neuroradiology and Neurosurgery and is an ad hoc reviewer for many journals including the New England Journal of Medicine, The Lancet, Radiology and Stroke. He lives in Cambridge with his wife Michele, an atmospheric chemist, and their 2 daughters Susan and Ana.